Looks OK from far away. Like some sort of riddle. 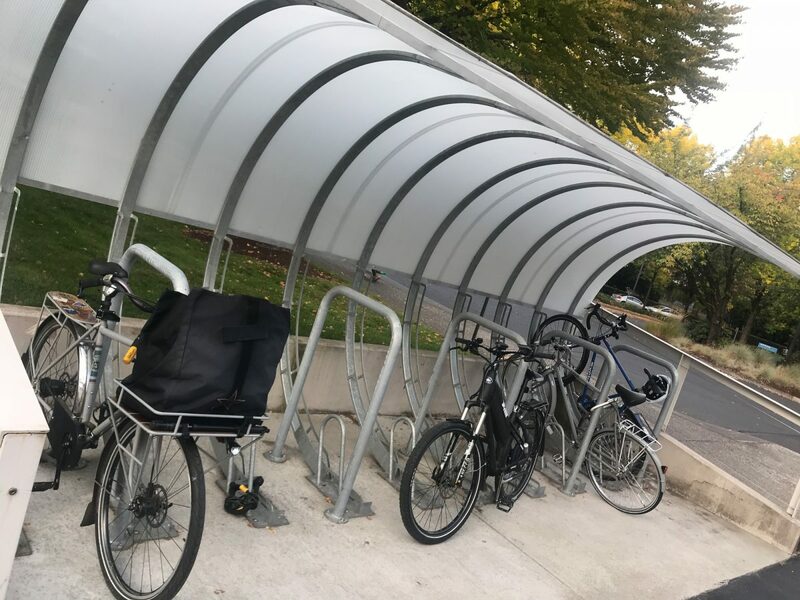 The other day I pulled up to an event at a Kaiser Permanente location in north Portland and was pleased to see a covered bike parking area. Then as I got closer all I could do was scratch my head. As I pulled my bike in, I couldn’t figure how I was supposed to use it. The fact that a bike was locked awkwardly — as if someone had given up on it — was a red flag. There two different metal loops and a big ramp thing and none of it really seemed to fit together. 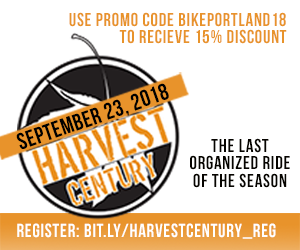 Another person was there with me (who happens to be one of the most senior leaders of the Portland Bureau of Transportation) said something like, “I think I’ve figured it out.” I looked over and he had rolled his front wheel up the ramp, which placed his bike fully under the canopy. That’s nice, I thought. But my bike has a very heavy and wide front end and there was no way I could do that. The intended use — which only works for 1) people who can figure it out and 2) people with a very narrowly-defined type of bicycle. 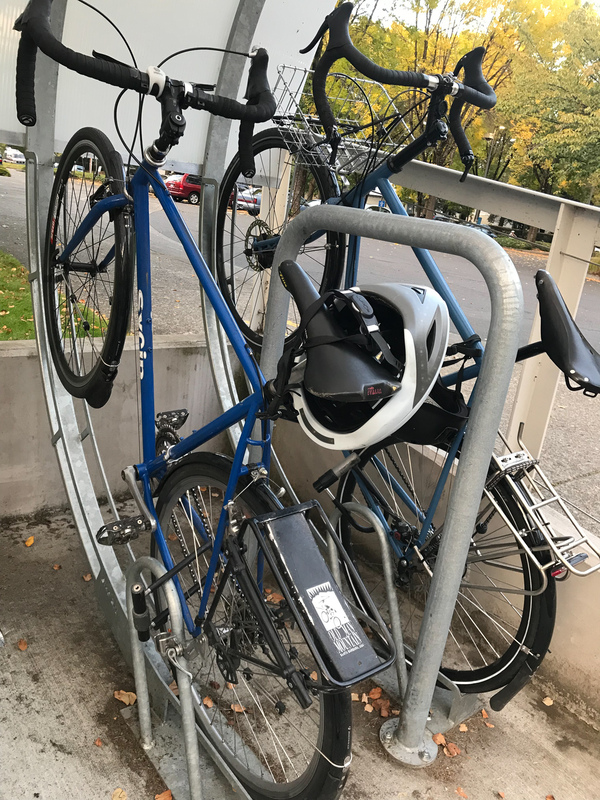 After a bunch of maneuvering, I was able to fit by backing in and clasping my lock around a bar. Oh! So the staples (which I ended up using) were added after-the-fact! Oh boy. I appreciate the effort. But there’s no reason to recreate the wheel. Bike parking is not complicated. 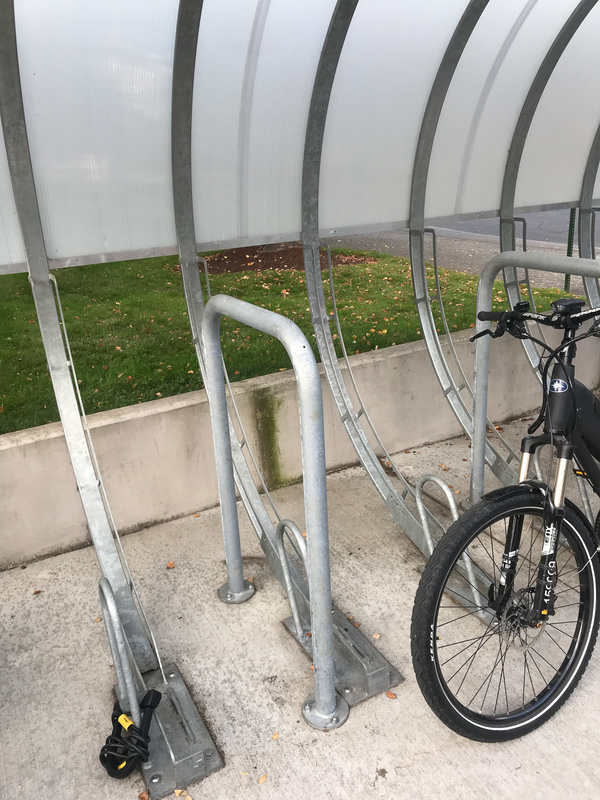 All you need are staple racks (preferably smaller ones with tube diameter narrow enough for a lock to go around a bike frame and wheel) with ample spacing and some sort of covering. 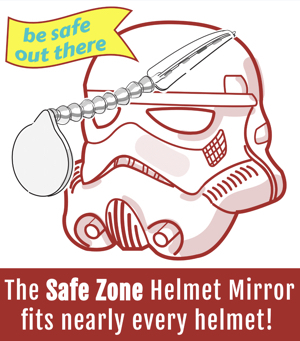 If you need help, PBOT has a handbook of approved racks and more information on their website. Two excellent examples are Green Zebra Grocery on Lombard and Roosevelt High School in St. Johns. As for Kaiser. I received a phone call from a customer support person who saw the tweet. They said they’d pass along the feedback to management. The post How not to do bike parking appeared first on BikePortland.org.